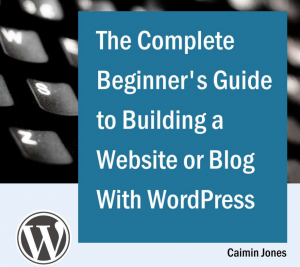 My friend and colleague, the talented and clever Caimin Jones, has written The Complete Beginner’s Guide to Building a Website or Blog with WordPress – comprehensive e-book guide for beginners who want to create a website or blog with WordPress without having to hire a designer or programmer. It’s a wild bargain at only $2.99! Caimin and I have worked on dozens of client projects over the past 8 years, and we co-founded Pawfun, where he designed and programmed the awesome software that lets visitors make ecards from their favorite photos of their pets. Now he’s running Genius Startup, a site replete with Caimin’s brilliant advice and terrific resources for setting up a profitable online business that doesn’t have to involve being a web genius or a design guru or making a large cash outlay. The Complete Beginner’s Guide to Building a Website or Blog with WordPress has step-by-step instructions for using WordPress, and includes how-to videos. Whether you’re new to WordPress or have been using it for 10 years, there’s a treasure trove of information in this e-book. that you can re-size photos right in WordPress. I’d been using PhotoShop and/or Flickr to re-size images. As much as I love blogging, and technology, I totally lack the geek gene. So I got a bit overwhelmed by the sheer volume of information in the book. While I loved the remarkably helpful basic tips and how-tos, I still want someone who really knows his/her way around WordPress to handle things like “Adding Dynamic Elements with Widgets,” creating special pages and forms, and organizing categories and tags. Nonetheless, whether you tackle WordPress on your own or hire a designer and developer to do it for you, reading this e-book will help you know what you can and should do yourself. Go buy The Complete Beginner’s Guide to Building a Website or Blog with WordPress right this minute!